The seeds had been planted 5 years earlier, but they didn’t actually begin to sprout until one day when I took a walk to the park. I was married with one child. After walking my then one-yr-old to the park on a Thursday morning, I found teenagers playing on the playset. Disappointed that these “truant hooligans” were using the equipment for tag, I turned my stroller around to head home, since running teens would not make a safe environment for my newly walking one-year-old. “What planet are you from?” I asked. OK, not really, but I could have asked that, because I was that surprised by their respectful behavior toward my son and me. Not one of them was wearing something I would not wear – nor wearing something I would be embarrassed for her to wear if she sat next to my husband on a plane. I realized they might make good babysitters, so I asked them for their phone numbers. 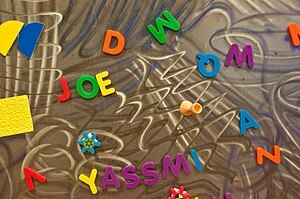 They excitedly gave me their names, when I realized I WAS ASKING COMPLETE STRANGERS TO BABYSIT MY KID! I had never heard of homeschooling until I was an adult. Chris and I had gone to public school, and no other path for my children had ever crossed my mind. The first I heard of homeschooling was as a newlywed when I attended a family funeral where I met Chris’s cousins who homeschooled. “That is bizarre!” was my only thought. 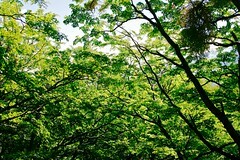 It is sad, but my first look at almost any change is always a negative look, with my mind locked shut. But seeds were planted, and they grew in God’s timing – which happened to be five years later– when I took the walk to the park. Fast forward from my park story two years, and I had a three-year-old and a baby. I have heard that we are a product of the books we read, the words we hear and the people with whom we associate. I suddenly realized that although as an adult I can choose my books, CD’s and surrounding people, my some-day-5-year-old, would not have that option. He would be a product of his zipcode that determined which school he would attend. During this same time, a good friend of mine innocently shared a story of her 1st grader. She had gone to school to help with the class, and took pity on her son’s classmate, a 6-yr-old who was working through his lettering book. While the rest of the class used the “writing station time” to go through one letter at a time and had mostly progressed to the “R-S-T-U-V” stage, this little guy was still on the “D-E-F-G” pages. She knelt down and helped him, while he got more and more frustrated. The teacher ran over to my friend and told her to stop helping the boy. The teacher then turned to the almost tearful boy and gave him a verbal lashing for being so slow and behind the class, and he “would surely be doing letters in summer school if he didn’t pick up his pace!” My friend was upset, seeing the damage the teacher’s words could do to the boy, but not sure what to do about the situation. Obviously, there may have been much behavioral history with that child in that class, but the teacher’s lashing threats didn’t seem likely to inspire improvement. Besides, there were twenty-five other students that needed the teacher’s attention; she certainly didn’t have time to cater to every rabbit and snail, so she was choosing. I may have done the same if I were a teacher of twenty-five 6-yr-olds! It was around this time that it dawned on me: If I were hiring someone to watch over my children 30 hours/week, it would not be a light decision. I would be interested in the person’s love for children, patience and understanding during challenges, religious stand, interest in flying planes into buildings and the many other rights and wrongs which people in our country coexist in disagreement. I believe we should take the same approach to “hiring” someone to be with our children (plus 20-30 others in the classroom) for thirty hours a week. Even if MANY kindergarten teachers could teach my children better than I, have more patience, more experience and more creativity than I, NOT ONE could love my child more than I, and therefore, we chose to homeschool…at least for a while. Define what you want; Learn from somebody who has it; and Do what they have done. As with major decisions, we prayed while we listed the pros and cons of each schooling scenario, and then made the decision that was best for the Brady family. My goal with this week’s Letters on homeschooling is not to make my decision be your decision, but to encourage you to strive for excellence even in the education of your children. I am embarrassed to say that there was a time when I didn’t believe that my children’s education fell within my responsibility. “Isn’t that part of paying taxes?” Now I think differently. I have been very impressed with the homeschoolers I have met, and would love them to influence my children. When I hear, “Mom, can you wake me up at 6am tomorrow, so I can read before school?” from my daughter, or “I am selling my ski-boat that I bought when I was 13 with money from the business I started,” (selling CD’s of his piano playing) from a young man at church, I recognize fruit on a homeschooling tree. Homeschoolers do not go without criticism, though; I have met many that are too shy, some that seem non-perseverant, and a friend this week told me she knew a family of them that was “rude, just rude!” But in my humble experience, the odds are that the fruit is the kind of sweet that I want to experience in my home. I am sure that God will continue to write a testimony for each of us. I am including links below of news articles in the past few weeks alone that continue to keep me happy to be a homeschooling mom. Frequently Asked (Homeschool) Questions, Frequently Overcome Obstacles and Who should NOT homeschool at: Throwing Myself Under the (School) Bus. 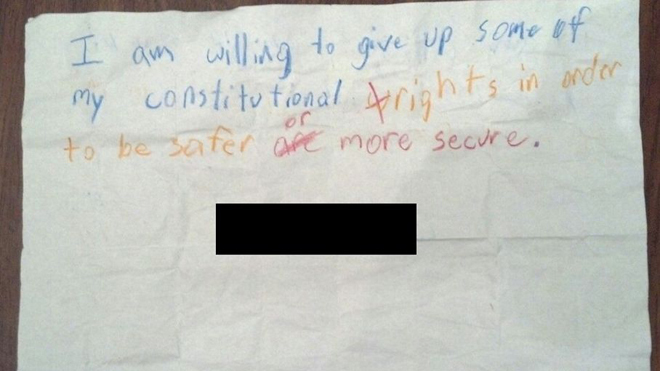 April 13, 2013: A father finds a note in his fourth grader’s bag that says, “I am wiling to give up some of my constitutional rights in order to be safer or more secure.” READ MORE. May 2, 2013: “’Can I kiss you?’ That’s what middle school girls were told to ask one another during an anti-bullying lesson at Linden Avenue Middle School in Red Hook, NY.” READ MORE. April 10, 2013: MSNBC’s Melissa Harris-Perry says, “We have to break through our kind of private idea that kids belong to their parents or kids belong to their families and recognize that kids belong to whole communities.” READ MORE. How do I get official requirements? Go to www.hslda.com and look it up. 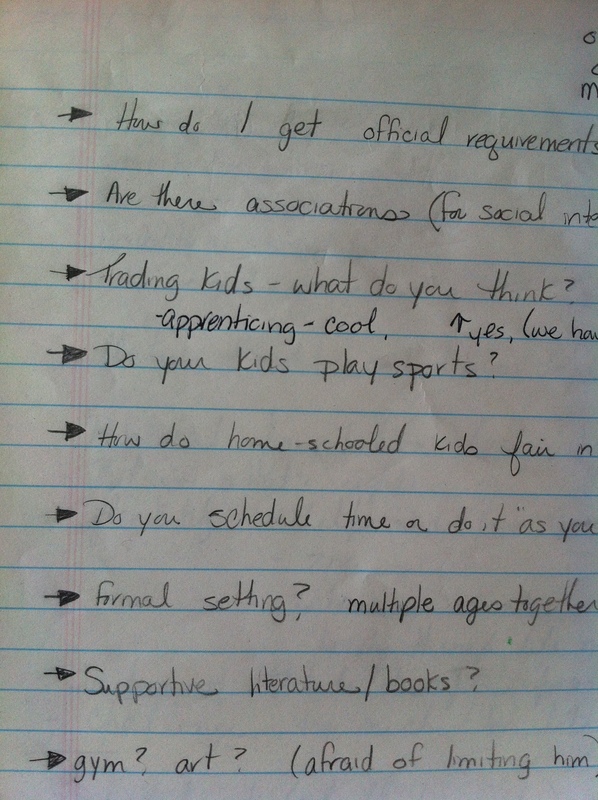 Trading kids for certain subjects: what do you think? We have not done it often, but it is helpful in higher maths, or foreign language if you don’t have the experience. Also, we have found that apprenticing is the best training there is, so we often trade kids to apprentice in new skills at our businesses. Socialization doesn’t occur with kids – peer pressure does. Social skills come from parents. How do homeschooled kids fair in college? Do you schedule time or do it “as you go”? We do better with a scheduled start time and rotation, but many are more flexible than I. Do you have a formal setting for school? 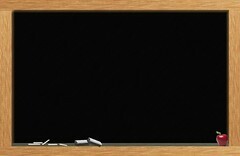 Chalkboard? Multiple ages together? It is as formal as you like. Subjects like history – where it doesn’t matter the order in which you learn it, we all are together. Subjects like math, I do each child individually. I used to think I needed a chalk board, since that is what I was used to growing up, but I found it unnecessary; it is more intimate on paper together. Gym class? Art? I don’t want to limit my son to my ability. Oh yes! There are plenty of classes available, so you are never limited by only your ability. I am all for a Biblical foundation, but am I limiting witnessing to other people who don’t have that opportunity if I don’t put him in a school with them? By homeschooling, you help create a foundation that will be strong for witnessing. If God calls you to homeschooling, then He has other plans for the timing of your kids’ witnessing. F – Fear God not man. A – Acknowledge where strength comes from. C – Conform to Christ not culture. E – Endure all things because Christ did first. This entry was posted in Motherhood, Personal Growth, Rooted in Faith, Sister to Sister, Uncategorized and tagged Chris Brady, Education, Education Choices, homeschool, James Dobson, private school, public school by Terri. Bookmark the permalink. Thank you for sharing insight on how you began your journey, and the thinking behind it all. It is a great encouragement to me as I homeschool my boys! I am THRILLED that you are writing this series of articles! Much of the blame for our decision to home education lies directly on your shoulders, because I had never heard of it before you dragged me to a conference … and I could never…ever…ever (said in my best Taylor Swift impression) thank you enough for it. Thank you Terri for the information and the resources. I am drawn to learning all I can about homeschooling and know that this is the path we want to take with our children. Thank you for the inspiration. Terri Thanks again for your thoughtful insights! What a great article on homeschooling! I’m an going to share this! Thank you! It’s amazingly clear, that ‘we don’t know, what we don’t know’. I’m speechless at how strongly people fight to dumb down our education, thinking that equal results are equality. Not knowing something, doesn’t make it not true. Terri, Thank you for the insight and blessings of homeschooling. A few years ago, I would have never taken the jouney. The informaion and encouragement I received once I started asking questions was so helpful. We made the decision to Homeschool this past year. As the year comes to a close (if school ever ends,lol) I am so thankful and blessed. We look forward to another season of life long learning. Thanks! Thanks for your insights. I’m beginning to plan homeschooling my kids and this was very helpful to learn. My girls’s school is great but I know at least one of my girls will do much better learning from at home. I love going in to their school and helping out with the kids that need more help and guidance than they are getting at home and it helps the teachers focus on all of the children as they are needed. This was very helpful, I’ve often wondered many of these questions. Thanks for sharing …..looking Foward to the upcoming ones. I remember my first exposure to homeschooled kids were the high school age kids of friends. Almost viewing them as a new species of teenager, I found them to be highly intelligent, fully dedicated to their Christian faith, obedient to their parents, far more articulate and incredibly more respectful than their peers. I was impressed, and remain so every time I meet more of them. Thank you for sharing this story. I’ve always wondered how you got started. I too have enjoyed the privilege of homeschooling my children. I tell ya, I feel so blessed to be able to be there for them to help broaden their horizons educationally over the last 15 yrs. Children will perform to the level you expect of them. Since I’ve tried not to put a “lid” on them, the sky is the limit especially when you work it the Thomas Jefferson Education way-(book by Oliver DeMille). I’m a proud homeschooling mom of wonderful children who are well adjusted, respectable, and “advanced” well beyond national/local average scores on their Scantrons. I’m not being arrogant, just proud of them and very grateful for the opportunity. I wouldn’t change a thing if I had to do it all over! Thank you for sharing the concerning articles at the end of your blog and making us aware of the infringements on parental rights. If we the people don’t stand up and lead, ALL freedoms we enjoy will slowly be stripped away-one by one! Thanks for this article Terri! We are just getting rolling homeschooling with our little guy next year and it means a lot to have people we respect and trust write articles like this. The questions and answers were awesome… some of the questions I’ve thought but not had the chance to ask yet. Great post Terri. Coming from a teaching background, I did not believe in homeschooling for very similar reasons you stated at the beginning. As soon as I was hired and became part of the ‘system’ I completely changed my perspective on homeschooling. I know it will be the route I will go when I have my own kids. It’s great to have a resource like this as I know you are a very successful home school mom. Thanks for all you do! My kids are all beyond school age now and I never thought of homeschooling as an option when they were young. But now, I see that it would have been a good option–and perhaps avoided some negative experiences and challenges. My youngest didn’t opt for the normal college experience, but instead, went on a mission for the church, and then completed a year of the school that Oliver Demille started. (George Withe University) It was a great growing experience and I got to curl up next to her some days, as she participated online, and discussed the subjects with the class. Fascinating! Really worthwhile!–and lots of quality people. We are starting kindergarten & preschool at home after labor day. I know we have made the right decision, but am still nervous. I don’t know where to start! Thanks for these postings. I always feel better after reading!